From a simple delivery service to a full logistics service provider. Over a century ago, a coachman drove through the streets of Amsterdam to collect dirty carpets. He took these carpets to his employer, a carpet cleaning firm in Diemen, after which he returned them clean to their rich owners. The owners regularly also gave the coachman parcels to deliver elsewhere. So he was in fact on the road again. This is how the coachman discovered a gap in the market and in 1897 he started his own delivery service. His mission? That was simple: to deliver the parcels safely, quickly and efficiently to the right place. He saw the fact that the parcels and the distances were constantly growing bigger as an interesting challenge, even if the delivery address was difficult to reach. The coachman delivered everything by Shank’s pony and with a big smile. This coachman was of course Grandad Saan and his delivery service was the very start of Koninklijke Saan, as we now know this family firm. Grandad Saan was a modern entrepreneur who every day made his business a little bit smarter than the day before. Parcels made way for complete household contents and Shank’s pony was replaced by a whole regiment of horses and carts. The business was one of the first with a Model T Ford, but even that car was later replaced by more modern vehicles. His little business expanded with lightning speed. And every new employee was inculcated with Grandad Saan’s standards and values from the start. Over the last century, the activities of the Saan family business expanded considerably and we are now working on a large scale. But our mission has remained the same. We always find a solution for your logistical problem, however challenging it may be, and we prepare each job down to the smallest details. We work safely, quickly and efficiently. In doing so we constantly innovate and modernise in an environmentally conscious and socially responsible manner. 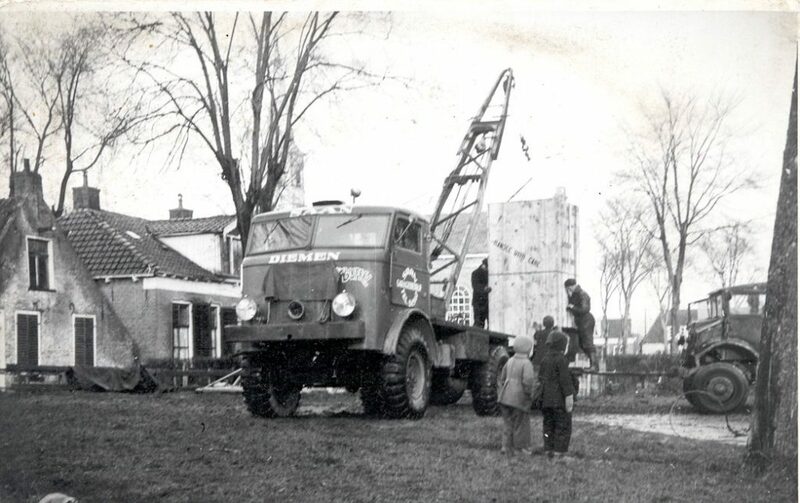 As a result, after 100 years of existence Saan was awarded the designation ‘Koninklijk’ (Royal). Saan is still owned by one family. Rutger Alferink has been the CEO since January 2016. 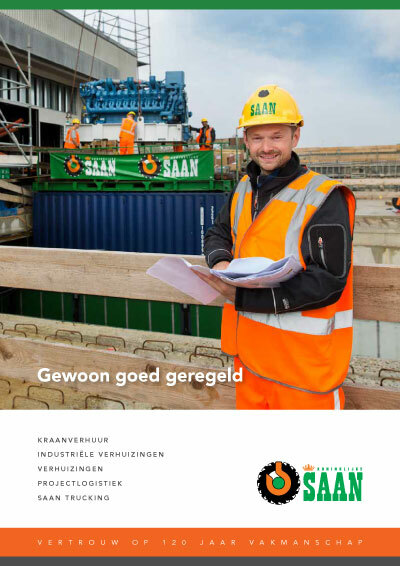 Saan is a member of and plays an active part in various sector associations and trade associations such as Vereniging Verticaal Transport, Transport en Logistiek Nederland, Erkende Projectverhuizers, Ondernemend Diemen and Bedrijven Overleg Regio Tilburg BORT. Saan’s employees are exceptionally well trained and they have all the diplomas and certificates relevant to their work. Trainee crane operators and machine transporters/handlers follow a broad internal training programme in which they are assisted by experienced colleagues. If necessary, employees then obtain the VCA I and II certificates and attend (compulsory) further training in their specialist fields in order to develop further or to deepen their knowledge. Everyone at Saan attends monthly toolboxes with various subjects such as safety. Each year we make a percentage of our turnover available to good causes and special projects. We divide the budget between gifts and sponsorship. For example, since 2017 we have supported the non-profit-making Sa4 Foundation, the Saan family’s good causes foundation. We also sponsor all kinds of projects ‘in kind’ by providing staff, machines, equipment or storage space. Saan has set great store by society and the environment since the start. For many years we have observed the principles of corporate social responsibility in our policy development: transparency, ethical conduct, respect for stakeholders’ interests, legislation, standards of conduct and human rights. We are convinced that sustainability and efficiency go hand in hand. So we invest in cleaner equipment and energy-saving measures in our buildings. In the social sphere we support charitable, educational and sports projects. And we give people with disabilities an opportunity in the job market. See also our CO2 Performance Ladder. audits for ISO and VCA (Health, Safety and Environment). The certificate for the EPVs (Accredited Project Relocators) was successfully extended and we were passed the audit for the latest CO2 Performance Ladder standard with “Good”.